After an evening at The Bealach na Ba waiting for a glorious sunset (that didn’t happen! ), I headed for the shores of the beautiful Loch Maree. I had arranged to meet Gerry in the car park where we would get some kip, rise early and perform an aquatic raid on the mighty Slioch! The light was fading when I left Applecross but the roads were quiet (if you don’t count the herds of deer!) and things were looking good. An amazing part of the country and the drive down “that “ road and on to Shieldaig, through Torridon to Kinlochewe was lovely. It was past 11 by the time I pulled up to join Gerry (and two mobile homes) in the car park that was to be our home for the next few hours. A quick hello and I was soon rearranging the boot of the car into a bedroom. After what seemed like minutes, I was woken by a knock on the back seat drivers door. Gerry was up and ready to go! The sun was already up and the light was fantastic looking over Loch Maree to Slioch. Yellows and pink hues lit the sky above the mountain and coffee was enjoyed with a little porridge, before a short portage of the boats to the shores. A little after six and we were off, paddling across calm waters. The crossing was short, only about a kilometre or so and by half six we were transforming from paddlers into hikers! In just over 3km you ascend to the 981m top of Slioch so there is little time for a gentle approach! You are pretty much straight into it and ascending the slopes! Into the corrie and the gradient settled for a short distance before the final and steepest section up the “spear”. The weather was on the slide and the lovely colours we enjoyed over breakfast had now been devoured by monochrome greys! However the cloud was still above the summits and the views from the top were fantastic. 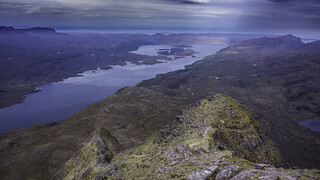 The eye is drawn down the length of Loch Maree, but turn your head to the north and east and Letterewe and Fisherfield provide a stunning vista. The wind was picking up as the weather front approached so we didn’t linger. Memories of previous turbulent loch crossings were in the forefront of our minds! We needn’t have worried . Although the wind had increased the loch was still passable with care and before long we were back loading our cars up and starting our long journey home! It was 10am ….